First edition of the Douai-Rheims Bible. Photo by Lisa Powell. Image courtesy of the Dayton Daily News. Manifold Greatness opened at the University of Dayton Roesch Library in Dayton, Ohio on Friday, August 24. One of the highlights of our local exhibition is a first edition Douai-Rheims Bible, the first English translation of the Catholic Bible. For the exhibit period, it is sharing a case with a first edition King James Bible, on loan from Denison University in Granville, Ohio. In this post, we compare the two Bibles and their unique history. 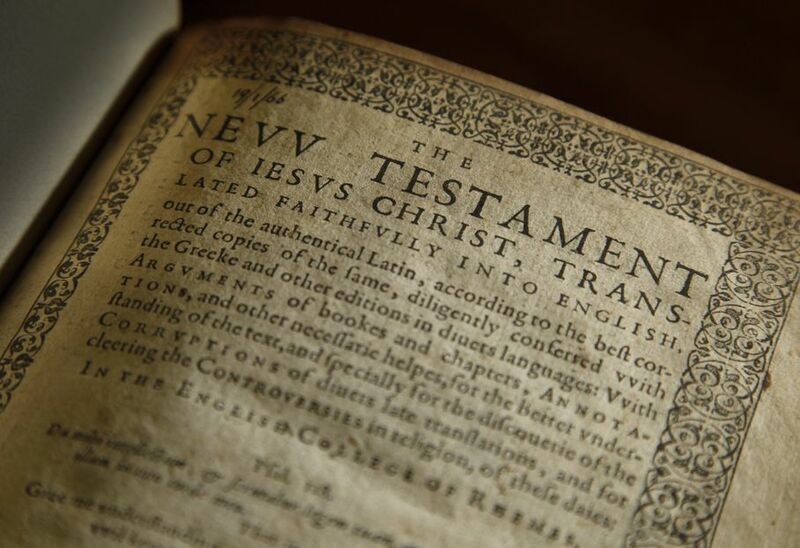 The origins of the Douai-Rheims translation were much different than the KJV. Due to anti-Catholic legislation and persecution during the reign of Queen Elizabeth I (a Protestant), English Catholics, led by William Allen, established a college and a mission seminary in Douai (Flanders) in 1568 and later at Rheims (France). The translation by English Catholics, known as Douai-Rheims, was published in several parts: at Rheims, the New Testament was published in 1582, and in 1609 the Old Testament was published in two volumes at Douai. The Douai-Rheims was not intended for use at Catholic liturgical services (where the language was Latin), although it did meet many needs. English Catholics could read it instead of Protestant English translations, and Catholic writers could use it to counter or refute Protestant adversaries who often quoted Scripture as part of their arguments. The Douai-Rheims was scrupulously faithful to the Latin Vulgate, the translation made by St. Jerome in the fourth century. In the sixteenth century, the Council of Trent considered Latin a quasi-sacral language: it was the lingua franca, for more than thirteen centuries, in all churches, monasteries, and councils; for all services, theological discourse, and biblical commentaries. The King James Bible translation relied upon original Hebrew and Greek manuscripts rather than the Vulgate, and freely incorporated a “few dignified or felicitous phrases” from previous translations, including the Douai-Rheims. Katy Kelly is the Communications and Outreach Librarian at the University of Dayton. Members of the King James Choir perform as part of the “Manifold Greatness” programming at Sumter County Library. Photo courtesy Sumter County Library. After an educational and entertaining series of programs at the Sumter County Library, the traveling exhibition for Manifold Greatness has moved to the next destination. During its display at the library patrons attended scholarly lectures, a King James Bible Quiz, a documentary film presentation, an art show and a King James Choir concert. Seven local artists submitted works for the “Expressions” Art Show. Each piece drew inspiration from a passage in the King James Bible. Four local artists judged the gallery displayed in our Main Meeting Room. A Grand Prize overall winner and 1st, 2nd and 3rd place winners were announced for those 18 and older and 17 and younger. Linda Hogon and Josie Holler won the grand prize, an Amazon Kindle, for their quilt inspired by the Book of Isaiah. Submissions to the “Expressions” Art Show at Sumter County Library. Photo courtesy of Sumter County Library. Soulful selections of music inspired by the King James Bible were sung by a King James Choir at Patriot Hall, a local concert hall in the historic neighborhoods of downtown Sumter. Led by Jacquetta Boone, the choir consisted of local talent ages 7 and up who inspired the audience with their performance. 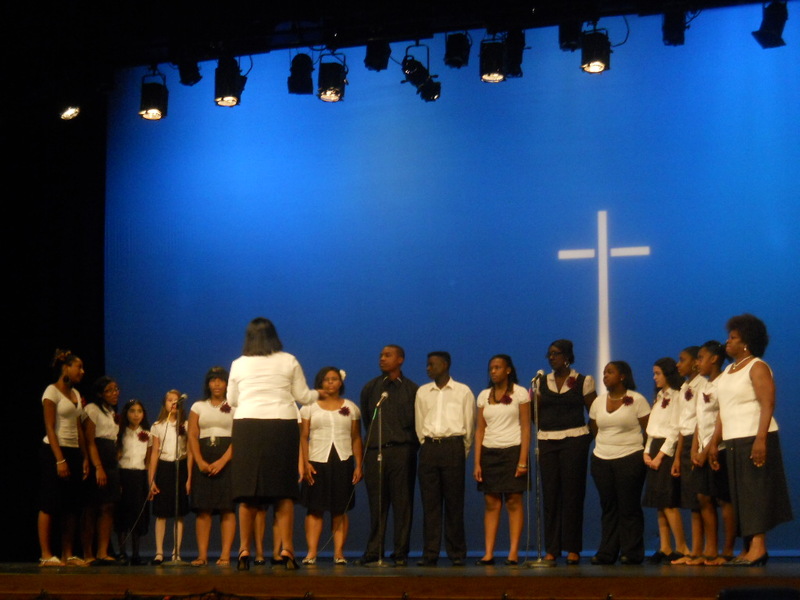 Tiger Productions Choir from Wilson High School in Florence, South Carolina opened the concert. 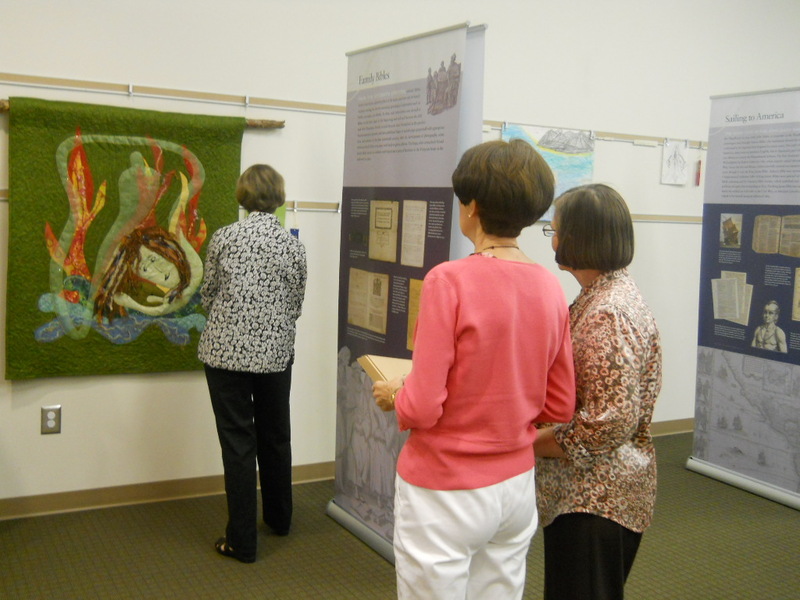 On Thursday, August 9th, the Sumter County Library wrapped up the Manifold Greatness exhibit with a lecture by Dr. Patrick Scott of the University of South Carolina – Columbia. For many years, Dr. Scott oversaw the Rare Books collection at the University. Luckily for everyone in attendance that evening, Dr. Scott brought a 1611 King James Bible for display. Patrons were thrilled to experience such a historical text in person. In addition to the 1611 Bible, Dr. Scott distributed reproductions of pages from a historic King James Bible for everyone in attendance. These keepsakes provided material to ponder as Dr. Scott lectured on the formation and development of the King James Bible. We thank Ms. Deloris Pringle for submitting the grant application on behalf of the Sumter County Library as well as our local partners the Sumter County Cultural Commission and the Sumter County Museum, which loaned historic family Bibles for display. Manifold Greatness: The Creation and Afterlife of the King James Bible traveling exhibition was an intellectually stimulating and thought provoking presentation, affording Sumter County the ability to think and speak in a new light about such a historic text. To see our pictures and videos from the event, please visit our Photobucket and YouTube accounts. Ford Simmons is the Reference and Information Services Coordinator/Webmaster at Sumter County Library. Detail of the 2nd page of Genesis from the King James Bible, handset in re-created type. Photo courtesy of Stan Nelson. As part of the celebration of the 400th anniversary of the printing of the King James Bible in 2011, the library at Norwich Cathedral in Norwich, England prepared an exhibition. During this exhibition, they planned to conduct demonstrations of letterpress printing, the method used to print the first editions of the King James Bible in 1611. In order to do the demonstrations, the library at Norwich needed authentic type of the kind used 400 years ago. The librarian there, the Rev. Peter Doll, contacted me because he didn’t know of anyone who could find/make all of the letters needed to re-set these pages. I am presently one of the few practicing punchcutters in the world. For this project, we decided to make type forms of the first two pages of the book of Genesis. In order to make the forms, I enlarged digital scans of pages from the original 1611 edition of the King James Bible until they were exactly the correct size. I then compared the founts (fonts) with a variety of type specimens to determine which kinds of type had been used in 1611. I quickly determined that some of the type was made from the matrices of Francois Guyot, a Flemish typefounder. Other founts were ‘Garamond,’ named after another 16th century punchcutter and still seen in many word processing programs today. A few lines remain unidentified, but are close to Garamond’s types. The black letter fount (also known as Old English) is a widely-used design that originated in Paris in the 15th century and continued to be used through the 18th century. These formes presented a challenge as they would require the acquisition of actual, three-dimensional metal types in the correct type designs–Goyot, Garamond, and black letter–that were used by the London printer, Robert Barker, 400 years ago. Finding authentic types would have been a demanding task a century ago, when letterpress was ‘king’, but today, commercial typefounding resources are nearly gone. 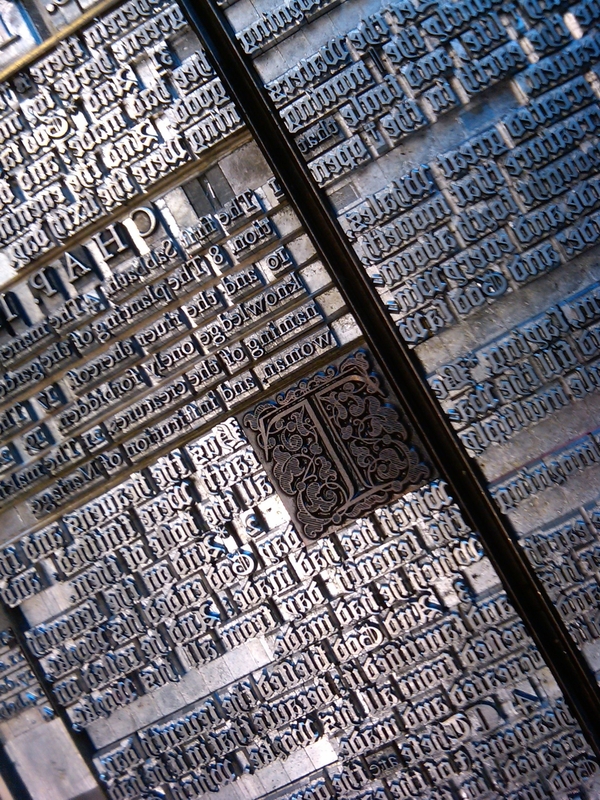 The solution to getting the correct printing letter was a collaboration between members of the American Typecasting Fellowship, a loose organization of amateur type founders who have worked to preserve antique type making materials. These type makers provided a great deal of the types needed. Matrices for the black letter survive in several museums, but were not available for casting. For black letter, a modern re-cutting provided the ‘bare bones.’ The Guyot types are not extant. Modern recuttings of many versions of Garamond exist and could be used on this project. But all of these designs would have to be specially cast for these pages, and many sorts had to be purpose made. Of course, some printing types simply cannot be found outside of a few European museums. For example there are the old, long s characters that look like f’s. Some of these were custom made with a pantographic engraver. Also, Barker’s King James Bible used numbers that do not exist today. These sorts were engraved by hand, in steel, and used to make the dies (matrices) from which types were cast by hand in a specially fitted early style type mould – just as the original types were manufactured. 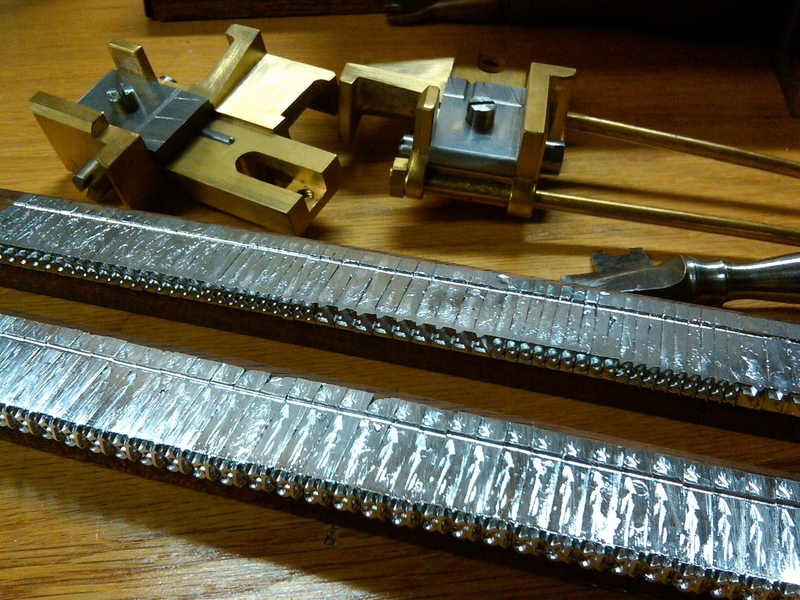 Cast sorts with brass German mould used in re-creating type from the 1611 printing of the King James Bible. Photo courtesy of Stan Nelson. I made twenty of the special characters primarily by engraving original punches in steel, from which special dies were stamped and the types cast in hand held moulds. These are the oldest techniques for type making, a subject that has been the focus of much of my work. While all of the text fount could have been hand made, time constraints made this impractical. But great care was taken to make the pages very authentic, such as hand casting special spacing pieces for the project and completely eliminating any modern materials. A friend and fellow type maker, Mike Anderson used his engraving machine to cut some of the needed letters in brass plate, from which types could be cast. Rich Hopkins and Bill Riese, also experienced casters, made various founts of the Garamond. Some of these had to be altered by hand engraving to make the letters more like the original. Jim Walczak used his Monotype caster to make the bulk of the black letter fount using modern matrices of a design that is extremely close to the original fount, with the exception of the capitals and some of the lower case. Instead of the modern body size this large fount was cast on the slightly smaller body, seen in the original fount, so that the pages match the original line for line. Jim also made some of the Garamond types. Type setting of the first two pages of Genesis proceeded in the traditional manner, letter by letter, line by line, taking special care not to use any anachronistic materials. Special spacing was cast in order to avoid using distinctively modern hollow spaces. The insistence upon using actual metal type, instead of a plastic photo-polymer plate, rests in its role as a teaching tool. In this digital age, most people have lost touch with the work of previous centuries. They deserve an opportunity to understand and appreciate the processes and skills employed by printers of the past. The pages traveled to England in specially made cases, designed to prevent any accidents. My biggest concern was with the customs agents — known for damaging curiosity. I put photos of the contents on the outside and special handling instructions to these officials, in hopes that they wouldn’t drop my type on the floor. Both pages arrived safely. I later traveled to Norwich for the opening of the exhibit and to present three lectures about the project. The type formes remain in the library’s collection, to be used as reference objects for years to come. Stan Nelson is a master typographer and a scholar on the history of type. He is also a practicing punchcutter. During the opening ceremonies for the London Olympics, Scottish vocalist Emeli Sandé performed a stirring rendition of the classic hymn, “Abide With Me.” The hymn is often sung at Christian funerals, and this performance was dedicated to victims of a series of bombings in London in 2005, in which 52 people lost their lives. Many of the phrases in “Abide With Me” are close variations of passages in the King James translation. For example, “healing in Thy wings” is a variant of Malachi 4:2, and “Where is death’s sting? Where, grave, thy victory?” is a variant of 1 Corinthians 15:55. Lyte wrote many religious poems and hymns throughout his life. As a student at Trinity College, Dublin, he won numerous prizes for poetry. “Abide With Me” is his best-known work, and was written shortly before his death from tuberculosis in 1847. The hymn is often performed to the music of “Eventide,” composed by William Henry Monk in 1861 to replace Lyte’s original tune. Members of Cornerstone Baptist Church, winner of the King James Bible Quiz. Image courtesy of Sumter County Library. The traveling exhibition for Manifold Greatness is still on view in Sumter, SC, and many exciting events have taken place since our last blog post. 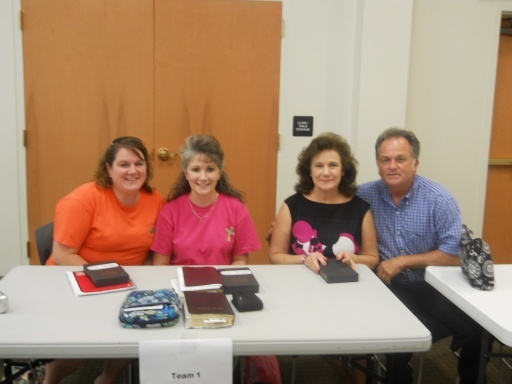 The Sumter County Library held a King James Bible quiz on Saturday, July 21st. Three teams competed to see who could name the Book, Chapter and Verse of popular, everyday phrases that originated from the King James Bible. At the end, the team from Cornerstone Baptist Church won the quiz and received copies of the King James Bibles as their prize. In fact, all three teams won Bibles! On Tuesday, July 24th, Dr. Harry Singleton of Benedict College discussed the influence of the King James Bible and other scholarly works upon Dr. Martin Luther King’s civil rights beliefs. While the King James Bible was the foundation upon which King preached and believed, other texts affected King deeply, including Howard Thurman’s Jesus and the Disenchanted, Paul Tillech’s Systematic Theology and Henry David Thoreau’s “Civil Disobedience”. “Civil Disobedience” declared one must shame the person you are confronting by passivity. Dr. King believed that being arrested and sent to jail would eventually shame those persecuting the oppressed. In addition to important theological and philosophical texts, Dr. King deeply believed in the poetry of the King James Bible. During slavery, slave owners used the Bible to legitimize that institution. Dr. King rejected that view, instead seeing Biblical figures such as Amos, Paul and Jesus as leaders of social transformation. Amos believed ritualistic religion is not positive, but justice and social transformation is something for which we all should strive. Paul and Jesus claimed man must suffer for God in order to change what is wrong around him. Dr. Singleton used the term “zeitgeist” to summarize Dr. King’s beliefs and actions during his lifetime. “Zeitgeist” means “spirit of the times.” Dr. King believed the time was always right for social justice and transformation. While most humans do not want change, the Bible, through its messages of hope and justice, calls for a righteous path to free all people from oppression. On Monday, July 30th, Dr. Valinda Littlefield of the University of South Carolina – Columbia discussed the use of the King James Bible within the context of rap music. To begin the lecture, Dr. Littlefield played two music videos; “E Pluribus Unum” by the Last Poets, and “Gangsta’s Paradise” by Coolio. Dr. Littlefield examined the poetic beauty of the King James Bible. Rap music is a form of poetry, and rappers use the King James Bible to espouse their competing views of life. Coolio’s “Gangsta’s Paradise” discusses how the “gangsta” life is a lie. Dr. Littlefield believes Coolio’s issue is not living a life in the presence of God. Coolio directly lifts Psalm 23:4 which states “Yea, though I walk through the valley of the shadow of death, I will fear no evil: for thou art with me; thy rod and thy staff they comfort me.” In “Gangsta’s Paradise”, Coolio raps “As I walk through the valley of the shadow of death I take a look at my life and realize there’s nothin’ left”. Dr. Littlefield also stated in the song Coolio raps “how nobody is here to teach me”. In the Bible, David had God beside him to lead the way, but those stuck in the “Gangsta’s Paradise” do not. The lack of hope in street life is the opposite of the King James Bible, where hope is found. The Sumter County Library will continue to host events into early August, includng hosts events through the beginning of August, including a King James Bible Choir Concert, an “Expressions” Art Show, and the Closing Reception featuring Dr. Patrick Scott. Dr. Scott will display a King James Bible dating back to the 1600’s. Please visit our Manifold Greatness webpage, YouTube, and Photobucket channels for more information, video and pictures of events at Sumter County Library.